Buying a wedding ring for your man can be difficult. It is a purchase you need to get right, and definitely isn’t something you can buy with a “that’ll do” attitude whenever you see something that you think might be good enough. How are you going to do it? Matching sets of wedding rings can be great, but you don’t need to make them a prerequisite of buying. What if a certain type of ring simply looks better on you than it does your man, or vice versa? If you’re buying a ring for your man as a surprise, then you won’t know what he’s getting you anyway, which for us is the best way to be. The first time you should see your wedding ring should be on your wedding day. A wedding ring is unlike any other piece of jewelry. It’s going to go on your man’s finger, and stay there for the rest of his life. The only time he’ll likely remove it is if he’s playing sports or there’s health & safety implications in another situation. You need to know what he likes and what suits him; would you want to wear a ring or a piece of clothing all the time if you weren’t sure about it? The next step having found the perfect ring for your man’s style and personality is to make sure you buy something that you can make as personal as possible. With a wedding ring, that will usually mean an engraving, whether it is of your wedding date, the date you met, your names, or a place that is special to you both. 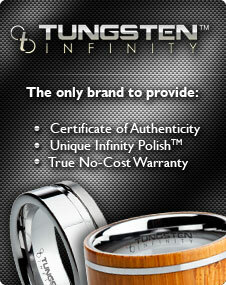 Although a wedding ring is always special, without personalization, it is just the same as any other. Yes, you want your man’s wedding ring to look great, but you also need to think about the practical side of things, too. How will his wedding ring stand up to the rigors of modern life? Depending on your man’s hobbies and what he does for a living, you might find yourself in a position where going for a tougher ring such as a tungsten one is a better choice than sticking to traditional metals like gold or silver. Imagine the scene. You’re in the church or your wedding venue of choice, you’re asked for the rings, you pull out your man’s, and it looks great. Then, horror of horrors, you discover that it doesn’t fit! We don’t need to go into too much detail here as to why you want to avoid this happening. Above all else, make sure you know his ring size, and consider how different metals, like tungsten, might be a different fit.